Commercial writing can be very lucrative. If you're looking for a way to turn your love of writing into a flexible career with great earning potential, starting a freelance commercial writing service may be a smart move. Commercial writers are writers who work for businesses, government agencies, or nonprofit charitable organizations instead of preparing journalistic articles for magazines, newspapers, or informational web sites. Commercial writers are also known as copywriters. If you're interested in a career as a freelancer, commercial writing is a great area of specialization. Both large and small organizations need writers, so there is plenty of work available for those who are willing to put in the effort. One of the best things about starting a freelance commercial writing service is that minimal overhead is required. If you already have a computer with Internet access, a telephone, and a fax machine, all you need to do is order a few business cards with your contact information and you'll be ready to start looking for work. In some cases, you may be able to use letters, reports, or memos you created in your past employment as writing samples. Just remember that sharing any information that may be considered confidential is not a good idea. If you know someone who owns a small business, you can offer to prepare a few marketing materials on their behalf. Volunteering for a non-profit agency such as an animal shelter or a fundraiser for juvenile diabetes is another good way to build up your initial portfolio. You can try making mock-up samples for fictitious companies, but this method is riskier because it advertises the fact that you're still looking for your first paying gig. While freelancers who want to break into print magazines or work for their local newspapers often get their start by submitting query letters pitching a specific article proposal, starting a freelance commercial writing service can be a bit tricky. Who should you contact when looking for projects? 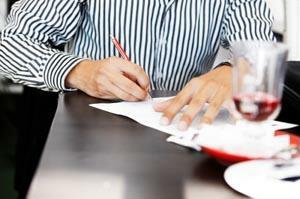 A freelance commercial writing service can easily be operated on a part time basis, if need be. Whether you're a mother with young children at home, frustrated with your current full time position, or just looking for a good source of supplemental income, it's possible to build a successful writing business in just 10-20 hours per week.When writing on a part time basis, however, it's important to make a commitment to communicating with your clients as much as possible. Try to keep at least some set office hours, such as working every afternoon from 2 to 4 p.m. Remember to check your email at least twice a day and provide your cell phone number so clients know you can be reached in the event of an emergency. If you're interested in beginning your own freelance commercial writing service, you'll definitely want to invest in The Well-Fed Writer and The Well-Fed Writer: Back for Seconds. Written by Peter Bowerman, these two books provide a comprehensive toolkit for all aspiring commercial writers. In fact, Bowerman promises that the advice in his books will help you achieve financial self-sufficiency in six months or less.